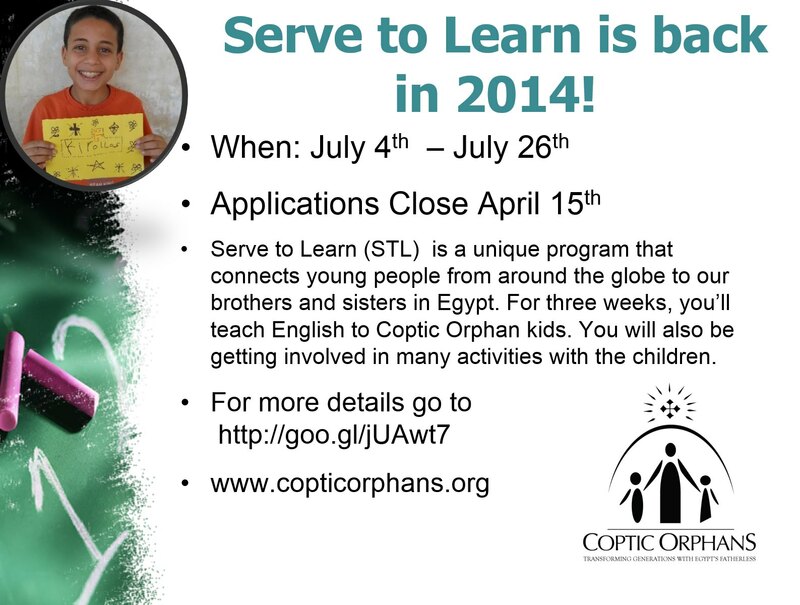 SERVE TO LEARN is back in 2014 !! Serve to Learn (STL) is a unique program that connects young people from around the globe to our brothers and sisters in Egypt. 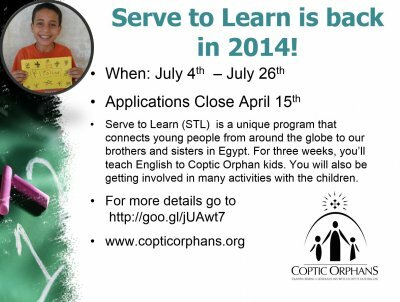 For three weeks, you’ll lead in teaching English to Coptic Orphan kids in an informal, direct and in a most interactive way. You will also be getting involved in many activities with the children and visiting them in their homes. You go in thinking, ‘These kids look so happy… but they’re poor, so how could they really be happy?’ By the end of it, the tables turn. You know they are truly happy and you wonder, ‘Am I really happy?’ I realized that my idea of happiness was only a 55” flat screen TV and an X-Box 360. But they have a heavenly happiness that I could not wrap my mind around. It sounds cliché, but I really mean this: I served at about a D- level. But I received at an A+ level from the children. I could not have paid any sum of money for what they gave me. Below is a link to all the info you need and the application form. You will also find videos and FAQs. If you have any further inquiries, please feel free to contact me on 02 9787 9777.